It's time for another episode of 205 Live on the WWE Network! Since winning the Cruiserweight Championship, Cedric Alexander has a target on his back. Buddy Murphy made a statement that he wants to be the next challenger, but he has to go through Mustafa Ali first. Which man will prevail in the rankings? Tune in for all the details. Hit F5 to refresh the live recap! Tonight, Bran Kendrick and Jack Gallagher look to crash the Lucha House Party. Also, Tony Nese wants to prove himself tonight on why he is The Premiere Athlete. And, after Buddy Murphy showed a more aggressive side, he will take on Mustafa Ali and both men look to inch towards being #1 contender for the Cruiserweight Title. Vic Joseph, Nigel McGuinness and Percy Watson welcome us to the show and we get started with a fiesta. Kalisto comes out with Lince Dorado and Gran Metalik as they head to the ring first, followed by Kendrick and Gallagher. DREW GULAK makes his entrance before the bell even dings and he heads to the ringside area. Everybody in the ring just stares at him unsure of why he is here and joining the commentary table. Gulak claims he is here to provide "expert analysis" for this match. Dorado and Gallagher start the match, Kalisto plays cheerleader, Gallagher with a headlock takeover, Dorado counters with a headscissors submission, Gallagher tries for a headstand, Dorado smacks him on the rear and dances. They lock up by the knuckles, Dorado takes him down, Gallagher pops up for a monkey flip, Dorado with a sunset flip for 1, Gallagher counters for 1, Dorado counters back for 1, Gallagher counters for 1, counter, counter, counter, counter, both men are dizzy after rolling around, Gallagher misses a wild swing and falls down, and Dorado falls on top for a 2-count. Metalik tags in, double Irish whip, Metalik trips him, Dorado holds him in place, and Metalik hits a springboard missile dropkick for 2. Metalik slaps him hard on the chest, handspring backflip, Gallagher ducks under, misses a clothesline, Kendrick with a blind tag, Metalik gives Gallagher a back body drop, Kendrick charges at him but gets tossed to the outside. Metalik hits Gallagher with a tope con giro, throws him back into the ring, Gallagher rolls out the other side, Metalik stands confused, and Kendrick kicks him in the back of the head! Kendrick covers for 2, kicks him in the head, crossface punches, then mocks the Lucha chant. Gallagher tags in, headbutt to the midsection, twists the wrist, Metalik tries to battle out, but Gallagher slams his head on the top turnbuckle. Kendrick gets the tag, stomps on Gran Metalik, puts him in an armbar, Metalik fights out, Kendrick with an Irish whip, Metalik side-steps him in a corner, Kendrick grabs him by the leg, whips him back into the corner, Metalik boots Gallagher in the face, rolls under Kendrick and makes the hot tag. Dorado kicks Kendrick in the head from the apron, connects with a springboard crossbody, rolls off his back, hits a running hurricanrana, two dropkicks, combo strikes, hits the handspring stunner, covers and Gallagher breaks the count just in time! Gallagher knocks Metalik off the apron, Kendrick backs Dorado into his corner, Gallagher tags in, hits the Gentleman's Dropkick, Kendrick hits Sliced Bread #2, Gallagher makes the cover, and this time Metalik breaks the count. Metalik gets double-teamed, whipped, walks the ropes, goes for a crossbody but gets caught, he lands on his feet, Metalik and Dorado superkick both of them, hit simultaneous suicide dives, Dorado throws Gallagher back in, goes up top, hits the SHOOTING STAR PRESS and gets the 3-count! WINNERS: LINCE DORADO and GRAN METALIK. Drew Gulak just stares and scowls at them. Next, we get a video of Mustafa Ali talking about Buddy Murphy ending with "Move or I'll make you move." Afterwards, Buddy Murphy is in the locker room talking to Tony Nese as he works out telling him to stop worrying about the past and worry about the future. Nese wishes him luck, then Dasha shows up to ask Buddy about his intentions in his match tonight. Murphy says he's still adjusting to the weight cuts but he is unstoppable. "I just hope the champ is watching." They lock up, Nese throws him into a corner, poses, taunts the crowd, slaps him on the chest, hard Irish whip, combo kicks, leg sweep, kicks him on the head, sets him up in the tree of woe, stomps on him, bicycle kicks, does his Premiere Athlete pose, then charges but misses a running kick. Nese gets kicked and punched, but runs him down with a back elbow, and another one. He does another leg sweep onto the apron, slides out the ring for a running forearm smash, throws him back into the ring, hits the Running Nese, covers and gets the 3. WINNER: TONY NESE. Next, we get a video packing for Hideo Itami and his new attitude. Itami said that when he had to team with Akira Tozawa he didn't like it. "Why do I need a partner?" Last week on 205 Live, when they lost their match Itami turned on Tozawa in frustration. We get a commercial for tomorrow's epiosde of NXT (Kassius Ohno vs. Tommaso Ciampa). 205 Live GM Drake Maverick is in his office when Cruiserweight Champion Cedric Alexander shows up. Maverick wants to know that Alexander can keep his cool during tonight's man event. Cedric said that he made his own statement to Buddy Murphy after what happened weeks ago so now he's good. Maverick informs him that next week in London, England, the superstars of 205 Live will be joined by the stars of the WWE U.K. Division as they fight alongside and against each other. "Next week is the perfect opportunity to showcase to the WWE Universe what 205 Live is all about." Alexander tells Maverick to tell the U.K. guys to step up their game. As Murphy comes out, we go back to two months ago where Ali defeated him in the Cruiserweight Title Tournament. Ali comes out next with his funky new entrance attire. The bell dings, they circle around, Murphy powers him up and into a corner, Ali ducks a swing, chop to the chest, and Murphy practically wipes it off. Murphy comes at him aggessively, Ali avoids a few attacks and goes for a running hurricanrana, Murphy blocks, Ali lands on his feet, chops him a couple of times, Murphy seems unfazed, Ali goes for a sunset flip, Murphy rolls through, dead-lift powerbomb, countered into a hurricanrana that sends him flying out the ring. Murphy gets on the apron, Ali dropkicks him in the face then hits a baseball slide. Murphy avoids an incoming Ali, kicks him in the gut, then hits a running suplex on the ground with a loud SPLAT. Murphy throws him back in the ring, covers for 2, pulls him up by the hair, hard Irish whip into a corner, then again to the opposite corner, then again, then a HIGH back body drop. 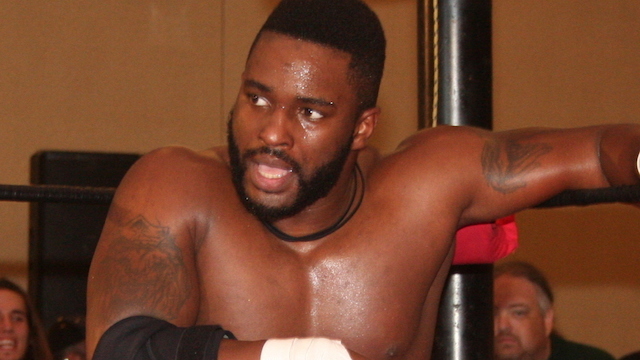 Cedric Alexander looks on from backstage with a look of worry for his friend Ali. Murphy kicks Ali in the back a couple of times, fakes a third kick but instead puts him in a rear chinlock. Ali counters with a jawbreaker, Murphy pulls him in for a back suplex, Ali lands on his feet, ducks a back swing, then both men collide in the middle of the ring with a double crossbody. Murphy gets to his feet first, Ali fights back, Murphy with a knee to the midsection, Ali kicks him, then does a pop-up dropkick. Ali clotheslines him, back elbow, whipped to a corner, side-steps to the apron, kicks him in the head, then the slingshot rolling facebuster COUNTERED into a sleeper hold! Ali backs him into a corner, Murphy keeps the sleeper hold on, finally gets go as Ali counters with his own sleeper, Murphy backs him to a corner, Ali jumps onto his back and Murphy is down to a knee. Murphy does a running cannonball just to break the hold, and both men are down. Murphy is up first, picks him up by the arm, kicks him in the head, Ali hits a hard forearm, Murphy seems inpressed, Ali punches him again and again and again, Murphy hits the combo kicks, Ali swats away the knee, kick blocked, backflips, tosses him onto the apron then does A TILT-A-WHIRL DDT WHILE IN THE ROPES!! Ali with a back-press cover, 1, 2, Murphy kicks out! Ali slams him into a corner, sets him up top, hits a forearm, Murphy blocks the superplex, suplexes him off, kicks him in the head, knee to the face, dead-lifts him up and plants him with a DDT for 1-2-NO!!! Murphy is again the first man up, Ali with a double-leg takedown, jackknife cover for 2, Murphy blocks a kick and POWERBOMBS him, then dead-lifts him up for another POWERBOMB, then dead-lifts him one more POWERBOMB! Ali's eyes are glazed over and the referee checks on him telling Murphy to back up. Ali challenges him to fight some more, so Murphy obliges, but Ali counters a powerbomb by SPIKING Murphy with the sit-out facebuster and covers for 2.9! Murphy crawls onto the apron, Ali sets him up on the top, Murphy pushes him off to the floor, but Ali backflips and lands on his feet, then SUPERKICKS him in mid-air! Ali throws him back into the ring, covers for 2, but Murphy gets his foot on the bottom rope. Ali goes to the top rope, tries for the 450 Splash, Murphy rolls out the way, splashes onto Ali's arm, hammerlocks his arm, throws him into a corner, hard arm wrench, Ali counters an Irish whip then rolls him up for 2. Ali hits a back elbow, hops up to the middle ropes, Murphy blocks the tornado DDT, hammerlocks the arm, throws him shoulder-first into the ringpost, hits Murphy's Law and gets the 1-2-3! WINNER: BUDDY MURPHY.